"Fresh from a West End run the "utterly enthralling" Shakespearience is back on the road in 2018! Join Shakespeare's Men as they fly through classics Macbeth, Romeo & Juliet and Twelfth Night in a whirlwind hour of mischievous storytelling. With tons of audience interaction, more than a dash of mayhem and a star turn from one lucky adult (shhhhh don't tell! 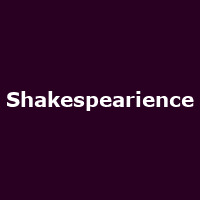 ), Shakespearience is the perfect treat for all the family. "